Have you ever tasted lava? Well you’re about to. 🙂 It seems that lime and pepper are enemies because when they are together it is all out war. Or is it a marriage? Where they complement each other so much that they bring out the best in each other. I’m still puzzled at the hotness factor of this sauce – certainly not like the regular pepper sauce. When we made this, the slightest taste of the lime pepper sauce had us running for cold water. 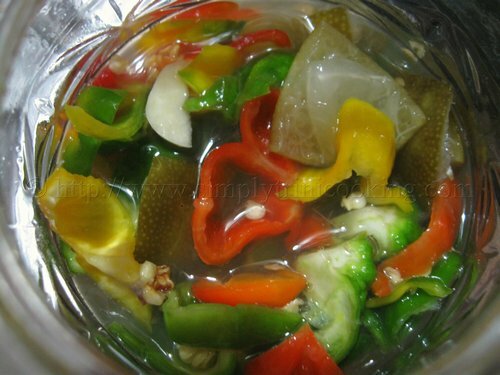 Yes, I know a pepper lover like me running for water. Possibly it could have been the type of pepper used; they did have a slight roughness on the skin; could have been a “warmer” variation of seven pot for all I know. But that warm was still too hot. Of course it could have been the direct sunlight in which we placed the bottle in outside. Whatever the reason, all I can say is be warned and do have a glass of milk close by :-). 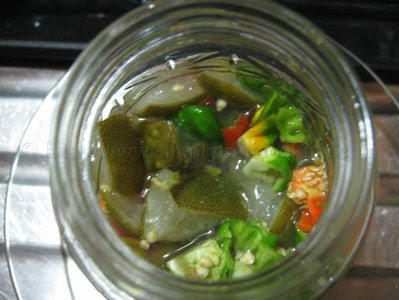 Here’s Lime Pepper Sauce. 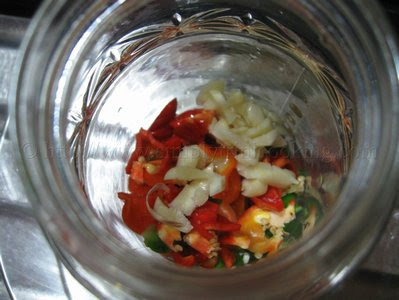 Prepare the bottle and its cover for the lime pepper sauce by scalding with hot water. and the lime. Continue to layer in this way until ingredients are used up. Note: You are also pouring in the water in which the limes were boiled in. When finished, store in a cool place. 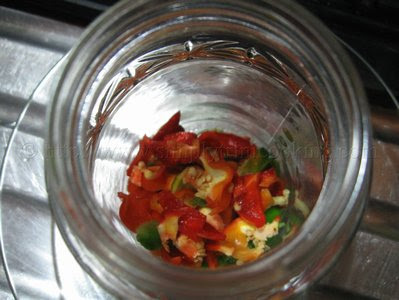 acid from the lime to work on the pepper and also for the lime slice to be infused with some heat from the pepper. What we do as well is put the bottle in the sun. This seems to speed up the process. Well that’s it. See you soon. Ah gone! Well i didn’t wait a week but we made it and i poured it over chicken and let it soak for hours before i put it on the skillet tonight and it was amazing! Just wanted to tell ya we loved it! My brother, each time I visit I feel so at home. One day I hope to taste your food. You do such excellent work to portray Caribbean food at its best. 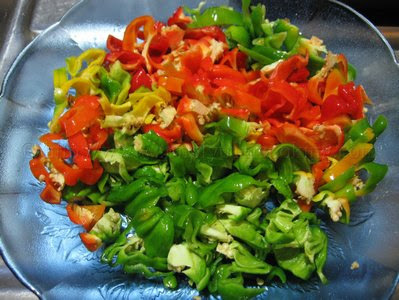 Woo, the colours of the peppers are brilliant – do you have a new camera? Or just the beauty of the ingredient! Nope! Just the same old same old on macro setting. 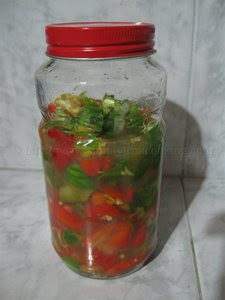 No problem at all Gadgeteer the pepper I used seem to be a cross between the normal scotch sonnet pepper and seven pot. The skin was semi rough and had a lot of heat. Too much heat 🙂 Now we have to use it very sparingly about 1/4 tsp. to be exact. isn’t 1/2 cup water too little of an amount? 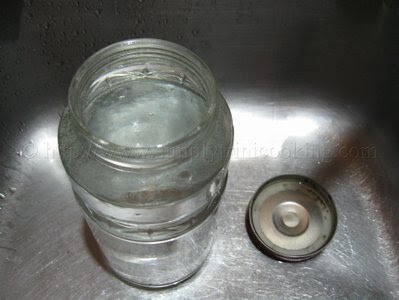 That is the amount of water measured and used to boil the limes. 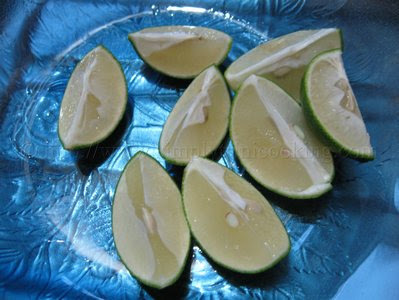 The lime we used was a small variety found in Trinidad that’s very juicy. Probably the reason for using that amount of water. 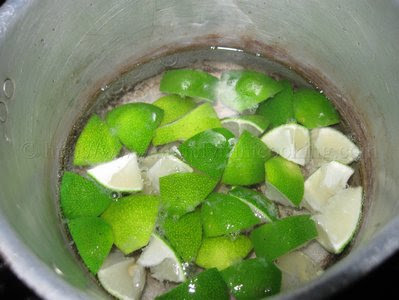 If you’re using a larger variety just put enough water to cover the limes and bring it to a boil. 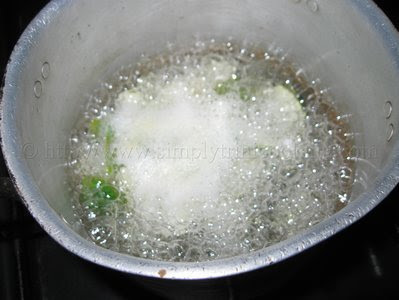 How long did you boil the limes for and when using the water did you strain it. 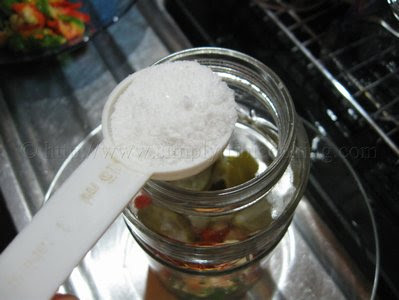 Def want to try this recipe, love lime pepper. 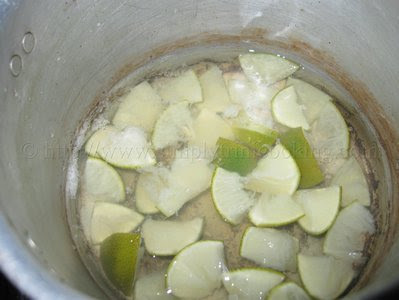 Boil for about 5 minutes or until the limes change colour. 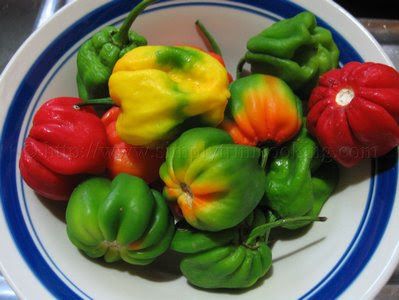 You will want to strain it if you don’t want the lime seeds in the pepper sauce. So do u throw out the water that boiled the limes in or do u throw that in the bottle with the pepper? Looks very easy to prepare.I’m going to make some today.